There has been a lot of talk about Spring planting progress and yield concerns in light of cool, wet May weather. Further speculation about the 2017 crop has been fueled by media reports of higher than normal replant acres. There has been a lot of talk about Spring planting progress and yield concerns in light of cool, wet May weather. Further speculation about the 2017 crop has been fueled by media reports of higher than normal replant acres. While there is little doubt the weather has resulted in reduced yield potential for some, it’s likely too early to understand what the overall, national impacts might be. While yields are important, an often overlooked weather impact is prevented plantings; acres that were intended for planting but never happened. This week’s post take a look at historic prevented planting acres and considers the impact of a swing in these acres. In figure 1, total U.S. acres of prevented planting since 2007 is shown. Over the last 10 years, total prevented planting acres have averaged 4.8 million acres (illustrated by the black line). Prevented planting acres reached a high of 9.6 million acres in 2011 and a low of 1.2 million acres the following year (the 10-year low for prevented planting acres set in 2012 is interesting given the yield story that year). Also shown in figure 1 are total prevented planting acres to corn (in blue), soybeans (in orange), and all other crops (gray). Prevented planting acres in recent years have averaged 1.7 million acres for corn, 1.0 million acres for soybeans, and 2.1 million acres for the other crops (Table 1). While total prevented planting acres have averaged 4.8 million acres, there has been quite a range around the average. Three of the last 10 years had prevented planting acres near the average (2009, 2014, and 2016). At the same frequency, prevented planting acres have been much lower than average with fewer than 1.7 million acres in 2007, 2008, and 2012. On the other hand, 4 out of the last 10 years prevented planting acres have exceeded 6 million acres (2010, 2011, 2013, 2015). In fact, during those four years, total prevented plantings averaged 7.9 million acres (prevented planting for corn averaged 2.8 million acres and soybeans 1.7 million acres those years). Figure 1. Total U.S. Prevented Planting Acres, 2007 to 2016. Data Source: USDA’s FSA. Table 1. Corn, Soybean, and Total Prevented Planting Acres, 2007-2016. It’s important to keep the scale of these acres in perspective. A few million acres of prevented planting is small in light of the nearly 90 million acres of both corn and soybeans expected to be planted in 2017. 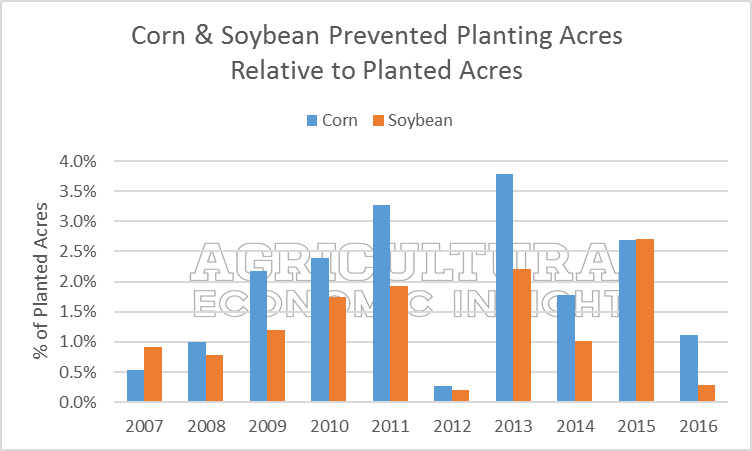 Over the last 10 years, corn has been impacted by prevented plantings more than soybeans. When prevented planting acres (figure 1) are relative to planted acres, corn prevented planting has averaged 1.9% of planted acres while soybeans has averaged 1.3%. These data shown on an annual basis in figure 2. 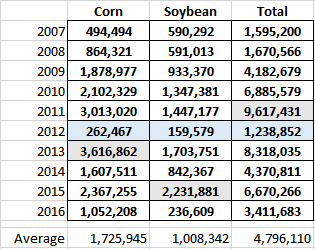 Furthermore, corn prevented planting acres relative to planted acres have exceeded soybeans 8 out of 10 years (the exceptions being 2007 and 2015). Figure 2. 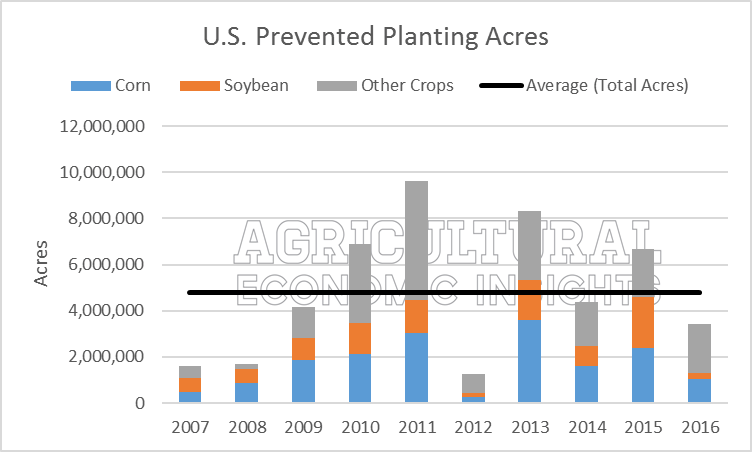 Reported Prevented Planting Acres for Corn and Soybeans as a Percent of Planted Acres. Data Source: USDA’S NASS and FSA. While prevented planting acres are typically a small share of total acres planted, it’s important to consider the impacts a swing in prevented planting acres can have on production and ending stocks. In 2016, corn prevented planting acres were 1.1 million acres, well below the 10-year average of 1.7 million. To illustrate the impacts prevented planting can have, we considered what 2016 production might have been like if prevented plantings were at their highest levels (3.6 million in 2013) and lowest levels (262,000 in 2012). In both cases, the 2016 national yield of 174.6 bushels per acre was used. Obviously, when planting conditions are extremely bad or good it can impact yields as well, but we will suspend that fact here. On the low side, fewer prevented acres in 2016 (262,000 rather than 1.9 million) would have resulted in 138 million bushels of additional production. Given the USDA’s estimate of ending stocks at 2,295 million bushels, this would have increased ending stocks by 6%. This change in production is equal to an increase in the ending stocks to use ratio from 15.7% (the USDA’s current estimate) to 16.6%. Another way of thinking about this is that the 138 million bushel increase in production change would have the same magnitude as the national yields in 2016 being 1.6 bushel per acre higher. In other words, the reduction in prevented planting acres has the same magnitude of impact at a 1.6 bushel per acre increase in the national yield. On the high side, record high prevented planting acres in 2016 (3.6 million rather than 1.9 million) would have resulted in 448 million fewer bushels of production. Again, given 2016 ending stocks of 2,295 million bushels, this would have had a significant impact (ending stocks of 12.6% vs 15.7%). Furthermore, the change in production would have been similar in magnitude to a 5.2 bushel per acre drop in national yields. A lot of attention and focus in recent months has been on weather related impacts to yield. An often-overlooked impact of the unfavorable planting weather could be an increase in prevented planting acres. From year to year, prevented planting acres can vary quite a bit. While the impacts seem rather small relative to the total acres planted (figure 2), the impacts can be significant when it comes to production levels. In 2016, for example, a change in prevented planting acres would have caused a quite significant change in ending stocks.